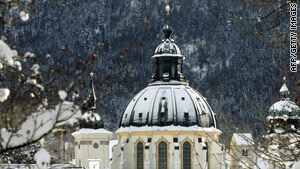 A file picture shows the monastery church in Ettal, Germany. Berlin, Germany (CNN) -- Authorities have raided a monastery in southern Germany as part of a probe into allegations that priests sexually abused children there, prosecutors said. Eight former students at the Ettal Abbey boarding school have reported that they were abused in 1954 and in the 1970s and '80s, the abbey has said in a statement. The head of the monastery and the school headmaster stepped down last week. Investigators with the Munich State Prosecutors Office visited the Benedictine Abbey of Ettal on Tuesday afternoon as part of their ongoing investigation into allegations of sexual abuse of underage children by priests there. Authorities are now assessing evidence collected at the abbey, the prosecutors said. No arrests have been made in the investigation involving Ettal. The investigation unfolds amid a growing scandal involving allegations of sexual abuse within the Catholic Church in Germany. Nearly every day since the end of January, people have come forward to report cases of sexual abuse by Catholic priests in Germany. News reports put the number of cases at about 150. Germany's highest-ranking Catholic, Freiburg Archbishop Robert Zoellitsch, has addressed the problem. "I apologize in the name of the church in Germany to all those who became the victims of such crimes," he said recently. "Sexual abuse weighs extremely heavily in the context of the church because children and youth put so much trust in priests," he said. "There must be no sexual abuse -- especially in the church." He also said he would raise the subject with Pope Benedict XVI when he visits him in March.